For those that are curious about the Apple Watch but don’t want to go in-store to check it out at this time, read on to find out about the experience by one of TechCrunch’s writers. This entry was posted in Gadgets, Tech and tagged Apple, Gadgets, iPhone, Tech. 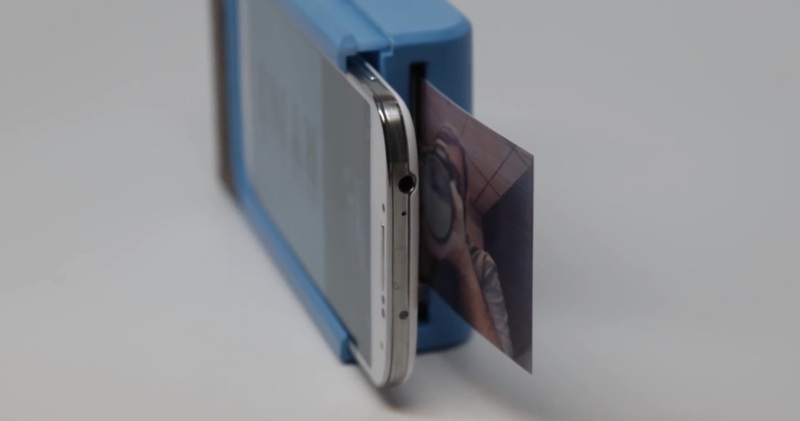 There is a French company that has developed a new smartphone case that will print out a small, hard copy of photos you take with your smartphone. The printer is connected to the smartphone via Bluetooth and prints out the photos in 50 seconds. The case will be first available via Kickstarter for $99 by early next year (2015). I think this is pretty awesome. Check out the video about Prynt below. This entry was posted in Gadgets, Tech and tagged Android, Electronics, Gadgets, iPhone, Phones, Tech. Apple has just released the latest in their iPhone line, the iPhone 6 and iPhone 6 Plus, last Friday, September 19, 2014. I’m not an Apple fanatic but I do enjoy playing around with Apple products. I do have an iPad, an iPod Touch, and an iPod Nano, but that doesn’t make me Apple crazy. I use the Touch and the Nano for listening to music, and the iPad was a gift which I am using right now to write this blog post. I’ve never had and I don’t think I ever will buy the iPod Touch or iPod Nano as new; I usually buy these Apple toys in “excellent used condition” mainly for a better price deal. For a phone however, I rather use an Android and wouldn’t mind paying for it brand new. Why? I think Android phones have better specifications and features than iPhones. 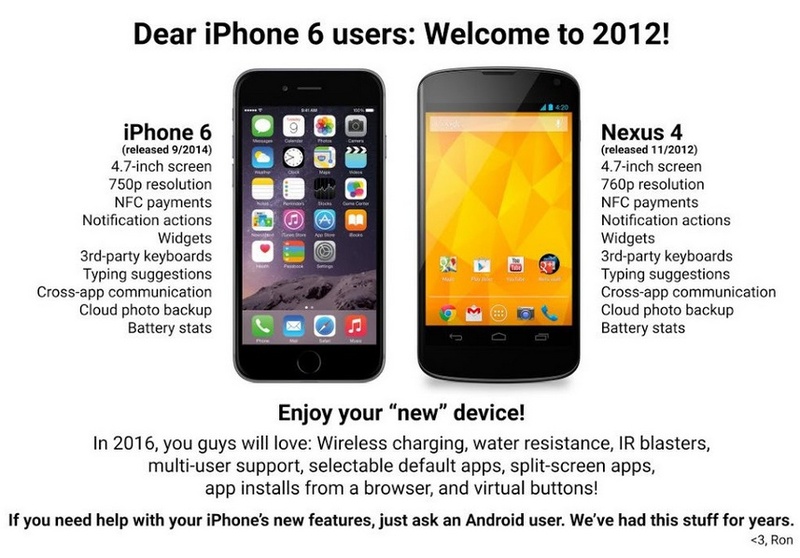 When the Android community released an infographic comparing the iPhone 6 with the Android two weeks ago, I found that funny. It is amusing to point out that many of the features in the new iPhone have already long been available to Android users. See the infographic below. 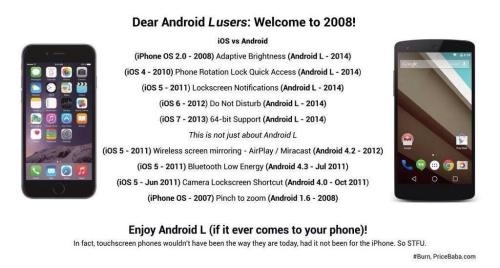 The iOS community responded with also an infographic pointing out that some features that iPhones have had for some time are just going to be released in the Android L software version. See the infographic below. Even though both sides have come out with features ahead of the other, I still think the features that were released first in Android were more significant than those which were released first in iOS. Like for example, Cloud photo backup is a definite useful feature and it’s awesome to know Android had it first, compared to the Phone rotation lock quick access feature available in the iOS first, which I think isn’t that big of a deal. But that’s just my opinion. This entry was posted in Gadgets, Tech, Wireless and tagged Android, Gadgets, iOS, iPhone, Phones, Tech.